Ethernet is an inexpensive and readily available technology for quickly transferring large amounts of data via the LAN. LAN eXtensions for Instrumentation (LXI) is the standard for Ethernet control of instrumentation. LXI is an open, accessible standard based upon Ethernet that identifies specifications and solutions related to the functional test, measurement and data acquisition industries. 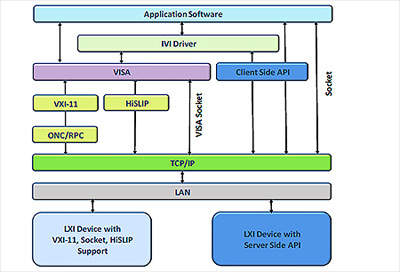 LXI instruments connect via the LAN to a common network that uses the TCP/IP network protocol (refer to figure 1). VISA is the standard I/O interface for communicating with LAN-connected instruments from application software running on a controller such as a PC. The number of wireless devices available on the market is exploding and in consequence, so is the number of users, with many people carrying multiple wireless devices such as a cellphone, laptop or tablet. In fact, Cisco’s visual network index (VNI) forecast* predicts that by the end of 2013, the number of mobile-connected devices will exceed the number of people on earth! Consumers are using their wireless devices to do much more than make phone calls including surfing the Internet, sharing photos, watching live streaming video and playing 3D games. These, plus countless other media-rich applications, are pushing current bandwidth availability to its limits and driving the need for the rapid deployment of new wireless technologies such as 802.11ac. While most people have probably heard of 802.11a/b/g/n, all of which are protocols for the 802.11 wireless networking standard, 802.11ac is still in its infancy and promises many performance advantages over prior Wi-Fi technology. A technical blueprint of a system that is intended for others to copy. The LXI Consortium has started an LXI Reference Design Working Group, and we are in the process of investigating and possibly implementing such a design. For more updates on this exciting development, look to the future issues of the LXI Newsletter in 2014. When you’re characterizing active devices, the right mix of speed and performance gives you an edge.